May 3-5 was our Nationwide Youth Camp. 4 young men & I joined the many young people who attended Youth Camp. Pastor Irie (an MK who grew up in Indonesia) did a great job preaching and many of the young people responded. At the same time, 4 churches held a joint Children’s Camp. 30 children attended this camp. Cindy & Joy Stanford did a great job teaching the children at this camp. Pray for the young people of Japan. Pray that they will respond to the gospel message and turn from idols to serve the true and living God. Do you remember Mrs. Nagasawa who was saved last January? We asked you to pray that her husband would be saved as well. Aren’t you glad we have a prayer hearing and answering God. He did just that. Mr. Nagasawa had been out of church for some time, but began attending again in April. Then on May 16th, he trusted Christ as his Savior. What a thrill it was to all of us to see him get saved. 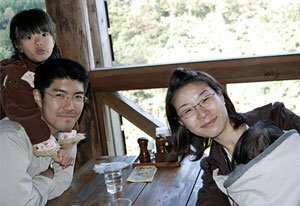 Pray for both Mr. & Mrs. Nagasawa who are preparing for baptism. From May we began a Men’s Meeting (we’d started our Ladies’ Meetings last year). The men meet once a month on Saturday morning and the ladies meet once a month on Thursday morning. We are currently doing a Bible study about how God helps us overcome our problems. Please pray for the men and women who are attending this study. Pray that they will learn to fully trust God with the problems they face. We live in a city of 280,000 people. Over 99% of these people are lost without Christ. The chanting of Buddhist prayers, the ringing of temple bells, the many, many summer Shinto festivals, and the open opposition to Christianity are daily reminders of the lost condition of most of those around us. Thankfully God has sent several our way. They continue to attend services at Agape, but have still not trusted Christ as their Savior. Please pray for these and the thousands more in our city for whom Christ died. Your prayers and loving gifts enable us to remain in this challenging field. Thank you for praying and giving like you do. May God richly bless you.